Pierre Westie: “We all know how important organ donors can be in saving a human’s life. Did you know the same can be said for animals? A dog named Star was found three years ago with a litter of thirteen puppies. When they arrived at the vet, it was discovered Star was in kidney failure and having seizures. After a few weeks of medication and love, she bounced back. She along with nine of her puppies survived and were adopted. 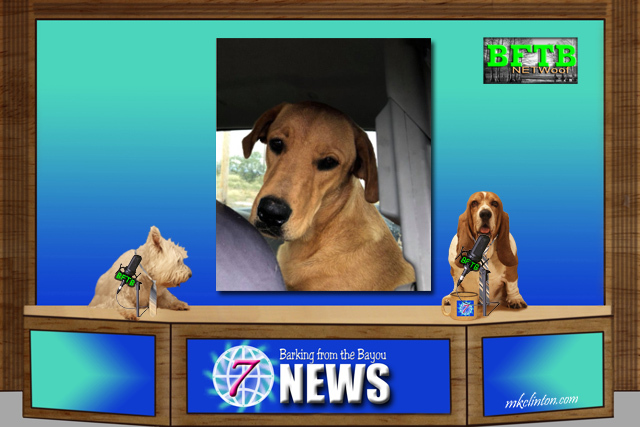 Bentley: “It seems that no matter how hard we try, there is always some sad news that must be reported. The fires in California have claimed 23 human lives so far with many others still missing. 250k people were evacuated from their homes and many will return to ashes. As with any natural disaster, the animals will suffer the loss of lives, forests, and homes. Volunteers are saving as many as humanly possible as they continue their rescue efforts against incredible destruction. If you want to help, there are several groups set up on Facebook and GoFundMe. Please make sure that you are donating to a legitimate organization. You can donate to The Humane Society of Ventura County, where they are accepting animals evacuated from the Hill and Woolsey fires. You can also purchase needed items from their Amazon Wish List. 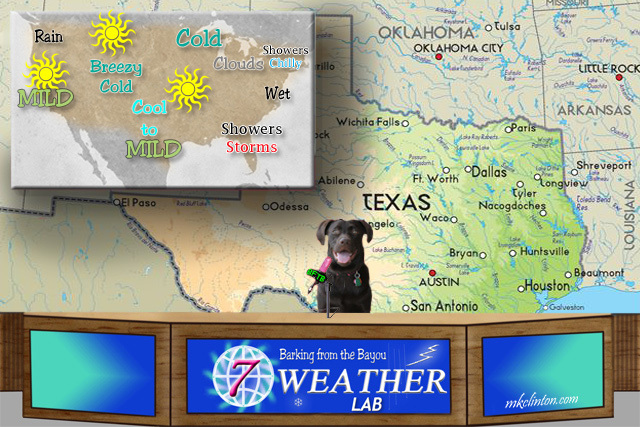 Paisley the Weather Lab: “In case you were wondering, the weather has definitely changed here in Texas. We went from the 80’s last week to expecting 32°F on Wednesday. It reminds me of the saying, ‘if you don’t like the weather wait a few minutes and it will change!’ I know we aren’t the only ones feeling the drop in temperatures either. They also had snow across the Rockies and in some northern states! Winter isn’t arriving until December but you might want to find your warm boots before then. The rains will mostly be in our eastern states, but the cloudy conditions are going to be filling the skies around the Great Lakes. The center of the country will enjoy sunshine with lower temps. The west coast will be sunny and mild but the smoke from the fires can make being outdoors difficult in some areas. 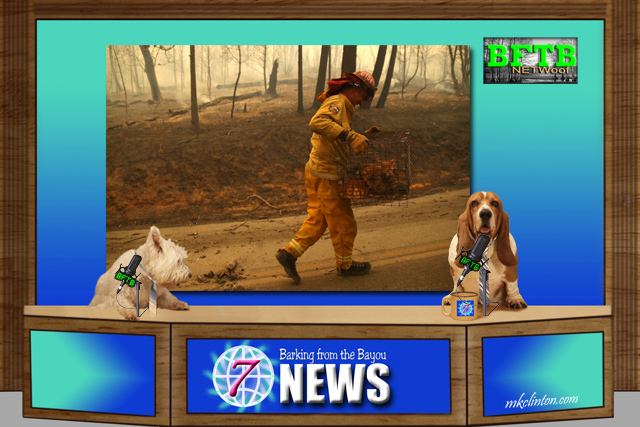 Bentley: “Yes, we are and hopefully, the Santa Ana winds will slow down, and the firefighters can get a handle on these horrid fires. 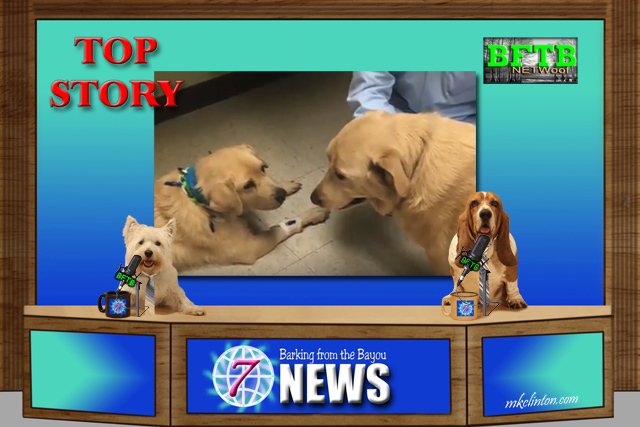 Please join us all week for some fun, facts, tips and pawsome new products. We look forward to seeing you each day. Leave us a comment so we know you stopped by. Momma used to live right where that Woolsey Fire is - Thousand Oaks and Simi Valley. Scary stuff. I think it is pretty funny to send the email with the kitty to Australia. They should have a sense of humor, and if not, then bummer for them. The fires in CA are so horrible. We pray everyday that they can be extinguished. 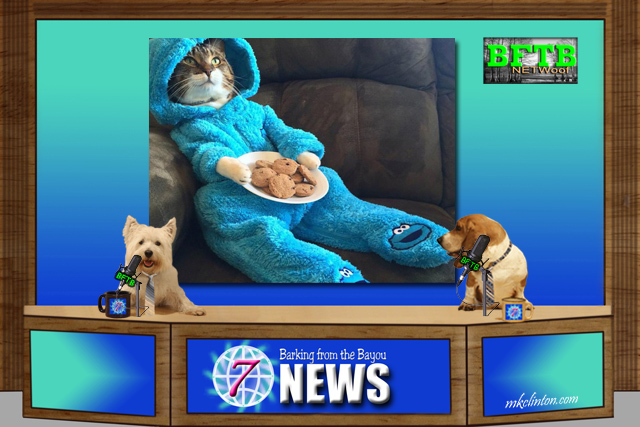 Best news reporting ever...you always cover what is impawting. Fire is my biggest fear and my heart hurts. Love how you do the news. Especially kitty in the cookie monster pjs. I don't like sad or depressing news. It's bad enough to bite the hand that feeds you, but a shotgun...yikes! Glad the man is going to be okay. Those fires in CA are very scary, and I'll donate some $ to help. I am praying for all those affected by the fires. Are we evil for loaughing about dogs shooting humans? If they practiced safety it would not happen. We are sure hoping the rainy season comes sooner rather than later here in California! Thanks for the great report guys! That was a great story about the kidney transplant. We wonder how many other dogs could be helped by similar opportunities. The fires are horrible. We hope that the firefighters and other first responders will be safe too. And all the people and animals affected by the fires - so sad. We will cross our paws for the situations to improve asap. UW Madison is awesome!!! So glad a happy ending for Star. Ugh, these fires are so awful. We would have been happy to send some of our surplus rain to CA! That top story brought tears to me eyes. Dogs are truly amazing.